On Earth Day most years, we can celebrate the progress that has been made cleaning up our waters and clearing our air. This year is different. A cloud of uncertainty hangs over the country’s environmental policies. President Donald Trump, through his rhetoric and executive orders, has made it clear he favors the interests of those who pollute over the interests of everybody else who have to live with the consequences of air pollution and climate change. He appointed a fierce fighter against rules to protect the environment and combat climate change to head the Environmental Protection Agency. 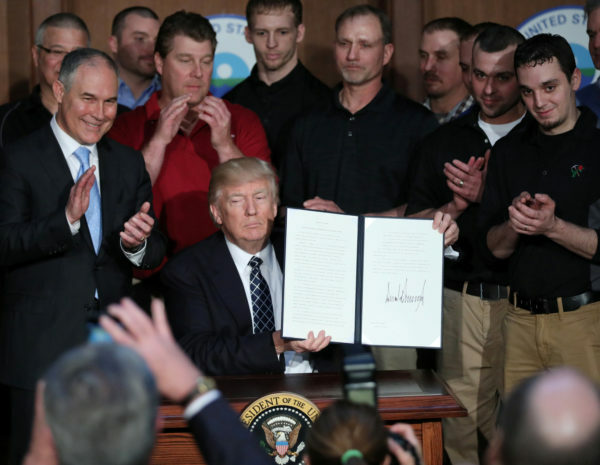 He has signed an executive order to roll back rules to protect human health and the environment. There is cause for alarm, not celebration, this Earth Day. A budget blueprint released by the Trump administration last month seeks to cut funding for the EPA by a third. EPA documents, obtained by The Washington Post, show how the agency plans to cut a quarter of its staff and eliminate dozens of programs to manage the budget reduction. Fifty-six programs would be scrapped and others dramatically scaled backed, including those related to climate change, leaking underground tanks and pesticide safety. Programs that study known environmental hazards including lead, poor indoor air quality and radiation would be scrapped under the budget proposal. The agency’s scientific advisory board would see its funding cut by more than 80 percent. In other words, the agency is passing much of its responsibility to states, which don’t have the resources to do the EPA’s job, and plans to make it easier for companies to pollute our water and air. Proposed cuts to other federal departments also imperil the planet. For example, the budget plan would eliminate $250 million from the Department of Commerce’s coastal research programs that work with communities to prepare for sea-level rise and worsening storms. All funding for the Sea Grant program, a branch of which is located at the University of Maine, would be eliminated. Funding for NASA’s earth observation work, an important source of data on how the climate is changing, would be reduced. Weatherization assistance and the Energy Star program, which encourages consumers to buy energy-efficient appliances, lighting, building products and equipment, would be eliminated at the Department of Energy. In addition to the budget cuts, which Congress should resist unless the Trump administration proposes a viable alternative, the president seeks to end regulations aimed at reducing climate-change causing pollution. He signed an executive order late last month seeking to undo many of the Obama administration’s policies to reduce pollution and address climate change, especially the Clean Power Plan, which sought to reduce carbon emissions from power plants. It could take years — and the ability to turn back court challenges expected from environmental groups — to actually change laws. So the most significant and immediate impact of Trump’s order is the message it sends to the rest of the world: that the United States doesn’t care about climate change and its impacts. One bright spot is that many corporations don’t share the president’s views on climate change. Many, including corporate giants Wal-Mart, Best Buy, Apple, Nestle and Anheuser-Busch, continue to seek cleaner energy sources and to reduce their emissions. This reality highlights the dangers of the Trump administration’s unnecessary and imprudent attempts to gut environmental and climate change policies and regulations. Reducing the United States’ consumption of fossil fuels makes economic and environmental sense.